National Library Week, National Poetry Month, National Public Health Week….. there’s a lot going on in April! All of these celebrations equal fun opportunities for library marketing and promotion of library’s services. Here’s a round-up of some resources and ideas to make your April a little bit easier. 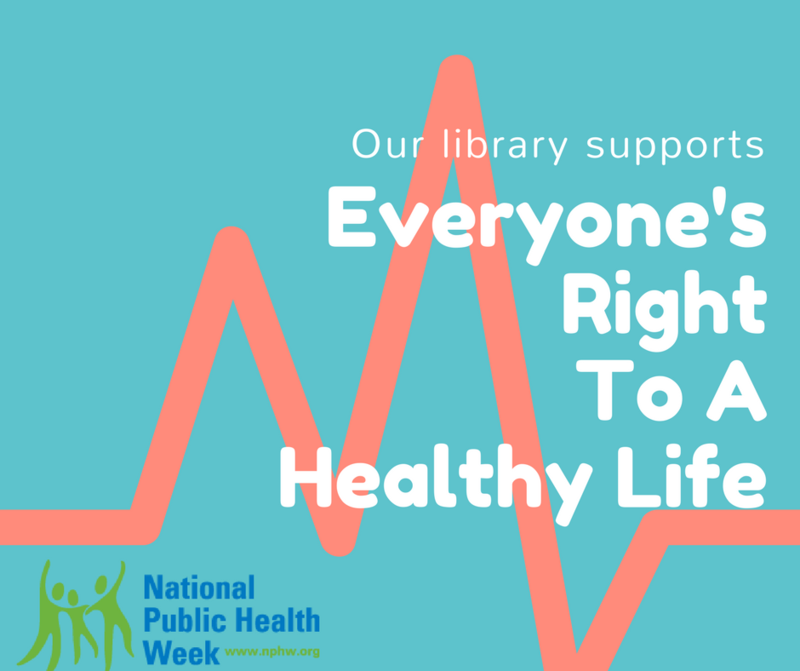 – The theme for Friday, April 6 emphasizes everyone’s right to a healthy life and healthy communities, which fits with the role libraries play for our patrons. The blue graphic we made is perfect to share on that day. 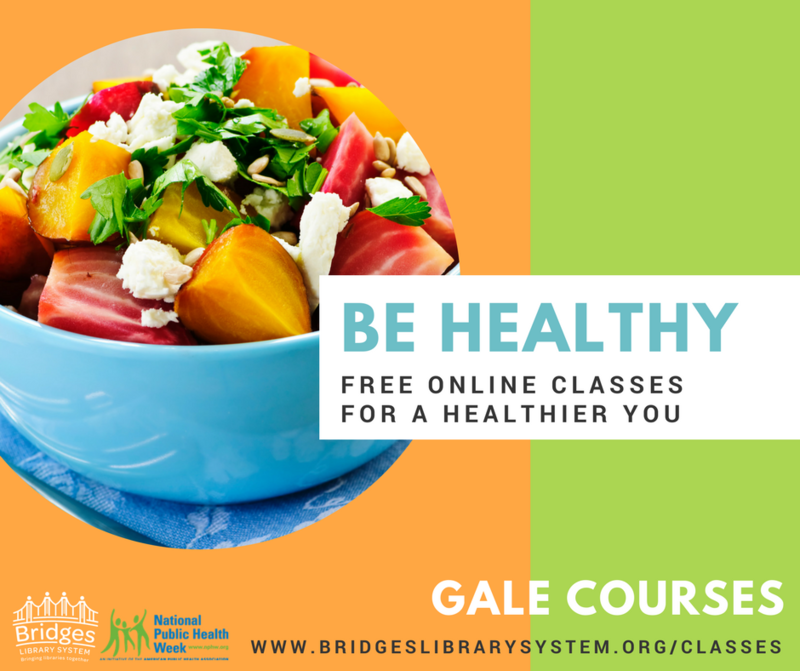 – This is a good opportunity to highlight the health-related Gale Courses that all Bridges Library System libraries offer. Share these graphics or print them to give to patrons. – You can find more information and resources on the NPHW website. – The Academy of American Poets hosts National Poetry Month in April. They have an idea sheet on their website of ways to celebrate. – April 26 is Poem in Your Pocket Day, where everyone is encouraged to carry a favorite poem with them and share it. This could be a good video opportunity for your library- make short videos of various staff members reading excerpts from their chosen poem. Display rotating themed displays of poetry books throughout the month, such as female poets; African-American poets; translated books of poems; classical poets; and how to write poetry books. Work with local schools to display students’ poems in the building; this would make a great local interest piece that you could pitch to the local media. Find poem quote memes on Google Images (or make your own!) and share online. – The Big Library Read is the first global eBook club. The ebook and audiobook are available, with no holds, on Overdrive. This year’s title is Flat Broke With Two Goats by Jennifer McGaha, a memoir about homesteading in Appalachia. – Overdrive has everything you need to promote Big Library Read! Graphics, bookmarks, a poster, press release, and more are available on their marketing page. You can also find an author letter and book club discussion guide on their website. – The theme this year is “Libraries Lead.” ALA has free downloadable graphics, posters, and ideas for ways to participate on their website. – Each day of the week there’s a different “celebration” for your library to participate in. One of note is April 10: National Library Workers Day. Look for a fun video coming from the Bridges Library System on that day! – Contact your local media to invite them into the library to cover a program or offer to show them the “behind the scenes” life of working at the library. – This is a great opportunity to promote the Consumer Reports database, since that’s a very tangible way that people can be smart about how they use and spend their money. I have a toolkit for you with various materials to print and share. – You can order free MoneySmart bookmarks, posters, and more for your library from the Consumer Financial Protection Bureau! – ALA has more resources on their website too, including a cool Facebook cover. There you go. Now you’ll never run out of marketing and promotion ideas this April!